On Sunday, Milan will have a double task of taking three points to keep their objectives on the table, and also breaking a curse of playing away to Sassuolo. The first objective is hard enough with injuries and fitness issues. But there is always some kind of dark magic about breaking a curse, a psychological feat that is not exactly tangible. Add to that the fact that Sassuolo are only six points behind us on the table and could cut that distance in half with a win, and this is going to be a difficult game. With both teams seeking European spots, and both coming into the match in good form, this match will be like a hunt. Both times we have played Sassuolo away in the league, we have lost. More specifically, Berardi has destroyed Milan hearts, once with a hat trick. And that same Berardi was just declared fit for our match the other day, so let’s hope Mihajlovic has the antidote for him and has given it to all of our players liberally. Sassuolio’s current form is a bit deceiving, with a L-D-D-W-W record. They have surprised everyone this season and currently sit in seventh place, just behind us. And their most recent win was against Lazio, a 2-0 win this past Monday. 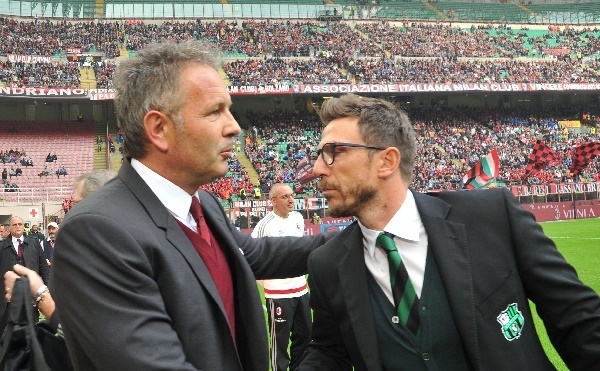 For that win, Di Francesco lined up Consigli; Vrsaljko, Peluso, Acerbi, Cannavaro; Magnanelli, Biondini, Duncan; Sansone, Berardi, and Defrel. And with Berardi being declared fit, he will only be missing midfielder Laribi for our match. Despite having an ex-Milan player in Acerbi, I would definitely think that with Milan being his preferred target in all of Serie A, Berardi should be the most hunted. Milan, on the other hand, have a growing list of injuries. Lopez and Ely are still out with their long term injuries, but Mexes actually returned to training this week, even if it is not clear as of this writing if he will be available for callup. Abate is suspended due to yellow card accumulation, and Niang was injured in a car accident after Saturday’s match, and will be out for at least two months. As if that weren’t enough, Luiz Adriano and Montolivo were both listed as not fit for this match as of Thursday, so they will miss out as well. Milan sit just one point behind fifth place Inter, who play Palermo at the San Siro this week, and with their “win” against Juventus midweek in the Coppa Italia are suddenly motivated again. So Milan cannot afford to drop points at all, we need all three to keep up and climb the table. 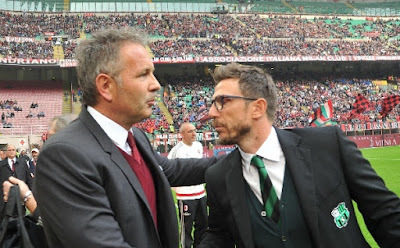 But Sassuolo, with a transfer budget and wage bill that are miniscule compared to ours, have been very well managed by Di Francesco, and their president, Squinzi, who is a devout Milanista. They have their hearts set on Europe, too, for the first time ever. So on Sunday, it will likely be the team who stays the most focused that takes the spoils. Because both teams are in the hunt. This match will NOT be shown LIVE in the U.S.